I kind of love the outcome of this pink frame. It was done for the same exchange gift for a local forum which I have mentioned earlier. This time I thought I would try to do crackle on wood. The IKEA frame was bought many years ago, so you can see some aging sign on the paper that covers the back of the frame. I used Jo Sonja carbon black as the basecoat, applied Plaid crackle medium and then used a mixture of 2 tones of pink color from Americana as the top coat. The napkin was bought from a seller online. 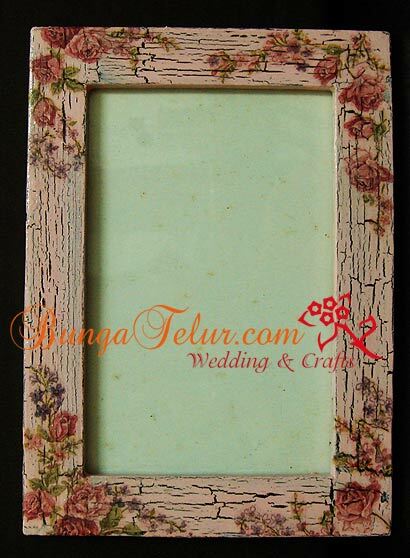 The floral motifs are small and just nice to fit the width of the wooden frame. I think I will do another one frame like this for my own use later. 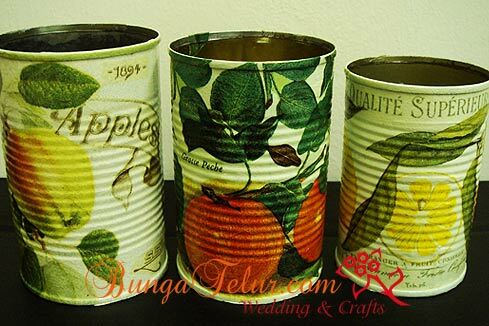 Remember my previous post about decoupage tin I made – The Apple Tin. Well, I found the first tin I made many, many years ago in one of the craft boxes. It is the one with lemon motif. Now I have one with apple motif, another with peach and the old one with lemon design. There is another work-in-progress for grape motifs. I’m not sure how many more of these fruits tin I will making in years to come, but if I find anymore paper napkin with beautiful fruits design that is suitable to add to my tin collection, I will surely make another one..heh! If you notice, the one with gloss varnish looks really glossy compared to the other two tins with normal decoupage varnish.